When Europeans arrived in New Zealand, most of the country was already known to Māori. Yet throughout the 19th century, a number of European men set out on journeys of exploration. Missionaries, gold miners, farmers, scientists – many endured great hardship in their travels. They discovered new routes, made maps and gave new names to the landscape. When Europeans began exploring New Zealand, Māori already knew most of the country. Māori guides often helped the new explorers. Explorers found new routes, made maps and named places. They showed great courage and made some very difficult journeys. Missionaries often went into unexplored areas, looking for Māori to convert to Christianity. 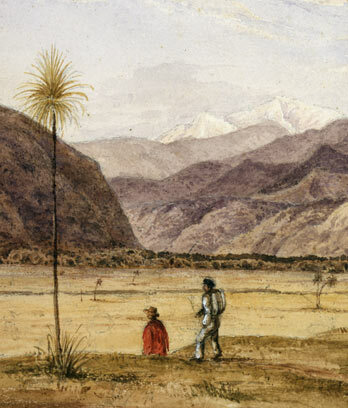 Samuel Marsden travelled around the northern North Island between 1814 and 1820. Later, other missionaries went further south, and saw Mts Ruapehu and Tongariro. The New Zealand Company planned to bring people from Britain and settle them as farmers, so it needed land. In the 1840s, men from the company travelled from Port Nicholson (Wellington) to Taranaki and the Wairarapa. By the mid-1840s, Europeans had visited most of the North Island. In the 1840s, the New Zealand Company looked for land for settlers in the Nelson area. Thomas Brunner went inland to explore the region. His third trip down to the West Coast lasted 550 days, and he got so hungry that he ate his dog. The first Europeans in Canterbury, Otago and Southland lived mostly around the coast. Later, some moved inland to find land for sheep farms. In the 1850s and 1860s, people hunted for a way through the mountains of the Southern Alps so they could get from the east to the West Coast of the South Island. Several passes were found. In the end, Arthur’s Pass became the main route. After gold was found in Central Otago, people rushed to the area. They explored the mountains west of Lake Wakatipu, looking for gold. By the mid-1860s, Europeans had visited most of New Zealand. There were only a few areas left in the Southern Alps. Some of these last places were explored by Charlie Douglas, who made maps and drawings of them. Mountaineers also travelled there.